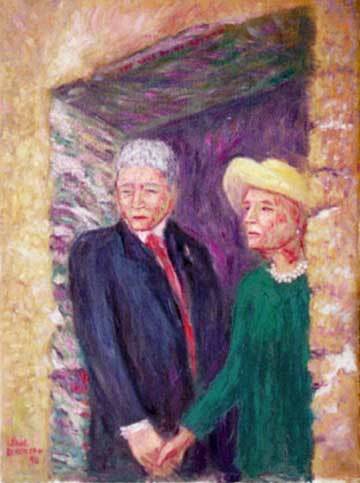 "The Door of No Return"
This picture is from President Clinton's Africa trip in 1998. The President and the First Lady are standing in the "Door of No Return," where the slaves walked the long gang plank to the ships, to be taken to America. It seemed symbolic also, in that, at this time, the President's enemies were stepping up their desperate attacks to stop him personally, and his programs to strengthen America. The President's enemies were also the enemies of the Civil Rights Movement. This sober picture, which was broadcast around the world seemed to symbolize the empathy of the President and the First Lady for the downtrodden of the world.